At hOMe we believe in the Power of Food as medicine and offer the most bio available, plant-based, low carbohydrate snacks with no refined sugar or preservatives. 100% Farm to Shelf Whole Food Nourishment from our hOMe to yours made with LOVE! Our key Organic Ingredients – Canadian hemp, raw cacao, sprouted flax, sprouted chia & sprouted buckwheat – have superfood status for their nutrient density and ability to optimize health. Shelf Stable Whole Food Ingredients & no refined sugar! Our Organic nuts and seeds are germinated to release digestive inhibitors, neutralize lectins & phytic acid and increase bio availability. Low and Slow is How We Go…..
Hand made in Small Batches on our Farm on Vancouver Island. Dehydrated at low temperatures for up to 36 hours maximizes life force and enhances flavour & texture. We take our time because you’re worth it! Want more energy? Mental clarity? Optimal digestion and assimilation? 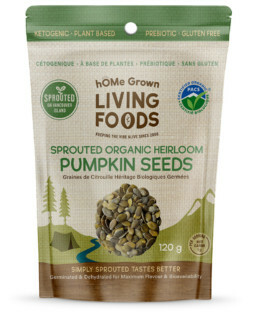 Sprouted Living Foods can support your health goals. Feel Alive! Raw foods are alkaline by nature and abundant in essential nutrients. Supporting better digestion and absorption of vitamins and minerals is one of our goals at hOMe Grown. Gluten Free & Nut Free cereal meets Trail Mix. Clustered with sprouted chia and flax; brimming with slow digesting protein, omega 3’s, vitamins, minerals and antioxidants to sustain an active lifestyle. Enjoy straight from the bag for the ultimate Snack-on-the-Go! technically seeds of plants in the grass family. Can cause inflammation, promote cravings, blood sugar dysregulation, and unhealthy metabolic effects. Gluten Free & Nut Free Cereal meets Trail Mix. Chocolate for breakfast! With ribbon coconut, sprouted pumpkin, sunflower, buckwheat, chia, flax and more…why not? Enjoy straight from the bag for the ultimate Snack-on-the-Go! Blaze your own trail! Whole food Grab & Go nourishment to fuel your active lifestyle. Enjoy straight from the bag or sprinkle on your salad. Blaze your own trail! Whole food Grab & Go nourishment to fuel your active lifestyle. Enjoy straight from the bag or sprinkle on fruit salad and yogurt. Gluten Free Cracker meets Flatbread! Slather with your favourite dip, or spread avocado and top with fresh tomato slices and sprouts for the ultimate Gluten Free Sandwich! NUT FREE Cracker meets Flatbread ~ A heavenly blend of B.C. Grown apples, sprouted buckwheat groats and sprouted USA grown sunflower seeds. Brimming with Omega 3’s, Magnesium, Vitamin E & Flavonoids. Sweetened with dates, warming spices and a whole lotta love! Nut Free, Gluten Free Cracker meets Flat Bread! Slather with your favourite dip, or spread avocado and top with fresh tomato slices and sprouts for the ultimate Gluten Free Sandwich! NUT FREE ~ Decadent Dessert Meets Energy Bar! Packed with antioxidant rich raw cacao, B.C. Grown Kale, Canadian cranberries and easily digestible protein from sprouted Sunflower seeds. Livies are the ideal health-enhancing treat for kids of all ages. Like a Raw Biscotti ~ perfect with an afternoon cup of Tea! A heavenly blend of unsweetened coconut, sprouted almonds, fresh squeezed orange juice and MACA. Naturally sweetened with dates, MACAroonies are rich in fiber, vitamins, protein and minerals. Ride the wave of Hybrid Whole Food Nourishment! 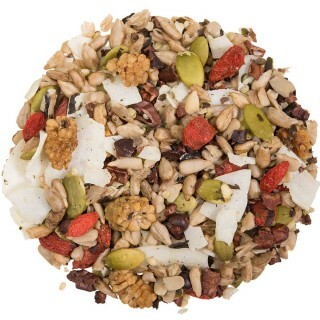 Protein dense, mineral rich organic trail mix with local wildcrafted seaweed. The most nutrient dense of all nuts. An abundant sources of magnesium, vitamin E, calcium, phosphorous iron and zinc. The highest source of selenium of all nuts. Brazil nuts have all the essential amino acids so they are a great source of protein and are high in magnesium, zinc, manganese, thiamin, and calcium. Not a Grain or Related to Wheat ~ Buckwheat is the Gluten Free seed of a flowering plant related to rhubarb! Low Glycemic, An excellent source of both soluble and insoluble fiber, iron and is a complete protein. Packed with soluble dietary fiber and vitamins. They are rich in essential fatty acids and the essential minerals: manganese, potassium, copper, iron, magnesium, zinc, and selenium. One of the lowest Glycemic Sweeteners with a deep caramel flavour. Coconut sugar contains the minerals Iron, Zinc, Calcium and Potassium, along with some short chain fatty acids, polyphenols and antioxidants. Apple juice infused. Contain an amazing array of phytonutrients, shown to be effective in lowering our risk of inflammation. Cranberries have long been valued for their ability to help prevent and treat urinary tract infections. The nutritional benefits of Flax are much more bioavailable when consumed in the powdered form. Rich in omega-fatty acids, lignans a powerful plant estrogen, antioxidants and an excellent source of dietary fiber. Transform your meals with this easy to digest protein rich pulse. Iron Rich, an excellent source of potassium, fiber, folate and and high in antioxidants. An easily-digested complete protein source, hemp seeds are a wonderful source of chlorophyll, fiber and vitamins and minerals such as iron, zinc, magnesium, and potassium. It is also an ideal 3 to1 ratio of Omega-6 to Omega-3 EFAs. Pure, hand-mined salt that is derived from ancient sea salt deposits. It has a rich mineral content that includes over 84 minerals and trace elements such as: calcium, magnesium, potassium, copper and iron. A high source of Vitamin C, resveratrol and minerals including iron. Rich in numerous health benefiting flavonoid phyto-nutrients, containing no added sugar, preservatives, color or sulphites. Rich in magnesium and phosphorus, and a great source of iron and zinc. An excellent source of B-complex group of vitamins such as thiamin, riboflavin, niacin, pantothenic acid, vitamin B-6 (pyridoxine) and folates. An excellent source of essential fatty acids, vitamin E, and minerals. Contains health benefiting poly-phenol compounds such as chlorogenic acid, quinic acid, and caffeic acids which are natural anti-oxidant & help remove harmful oxidants from the body. Our sprouting and low & slow dehydrating process creates the freshest, lightest, creamiest, nutrient dense walnuts. Learn how Whole Food Pioneer Shani’s own healing journey led her to create these healthful and energizing hOMe Grown treats! hOMe Grown Living Foods was founded in 2008 with a passion to provide nutrient dense Sprouted Raw Vegan Gluten & Grain Free Snacks to fuel an active lifestyle. Based in the Cowichan Valley on Vancouver Island, we make all our products by hand in small batches. Staying immersed in nature allows our Inspirations to flow into the finished product. We hope you can taste Love & Gratitude in every bite. Pioneer and Chief Formulator Shani Cranston founded Milagro Retreats in 2002, hosting international Yoga, Surf and Wellness Retreats. In her early 30’s, Shani was diagnosed with Type 1 Diabetes. Being a Health Advocate her entire life, this condition encouraged a deeper understanding of the alchemy of food and how it affects our bodies. As an avid Surfer, Yogi and Outdoor Enthusiast, she was on the search for healthy On-The-Go snacks and could not find anything that met her dietary needs. Shani’s inherent entrepreneurial Spirit has been nurtured through Milagro Retreats, providing hands on experience nourishing herself and others. This is the foundation from which hOMe Grown Living Foods was born in the old Tool Shed on their farm in 2008. Together with her Partner Willy McBride, Shani has slowly grown the product line, while Willy has built and configured every corner of the production facility. They have an Inspired team that works hard to bring you this exciting delicious snack food line.